Our highly skilled American artisans hand fashion each Sphera Design globe for lasting beauty. Each one of our globes progresses through more than 40 intricate steps in order to achieve unsurpassed quality. No two globes are exactly alike. Our meticulous attention to detail allows us to offer a lifetime guarantee of quality and craftsmanship. Beginning with museum quality cast acrylic sheets, each is cut to size, checked for optical clarity, and prepared for hand application of the graphics. Each globe design begins with specially developed, polar azimuthal projection cartography. Once we have achieved the balance of cartography and aesthetic design, it is transferred into a specialized silk-screen image. 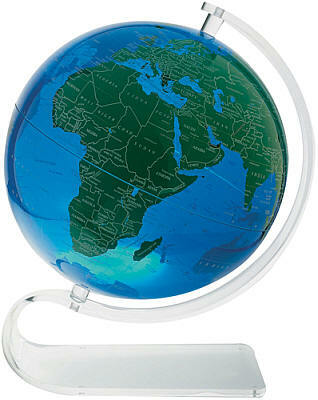 Each color applied to the globe requires an individual silk-screen. Depending on the globe to be created, this process can require eight to eighteen separate hand operations. Each piece is then carefully inspected and passed on to the thermal process. At this step, each piece must be heat soaked for several hours at high temperatures. Then with the skilled eye of a highly trained craftsperson, each piece is fitted into a blowing tool which uses only air pressure to create the hemisphere. To assure optical clarity, the hemispheres are free-blown, similar to glass-blowing techniques. Each sphere is slightly different from any other. The hemispheres are then passed to the hands of the trimmer. Here the two hemispheres are trimmed of any excess material, then carefully matched to create a complete globe. Next the globes are thoroughly cleaned and polished. Then, the highly skilled globe maker makes a final fitting and bonds the two hemispheres, making a complete globe. Finally, the globe is individually packed and prepared for shipment. Each globe includes a Certificate of Authenticity, signed by John Szal and Karen Davis, the Founders and Creators of Sphera Designs, personally certifying the quality and appearance of each globe. Each globe reflects a standard of excellence not achievable with today’s mass production techniques. From the multi-colored silk-screening to the meticulous blowing, shaping, and finishing, each globe is proudly passed from the hands of our globe makers to yours.